PRODUCT RATING Just Right. Low price. Lightweight. Textured side panel (with the Rubbermaid logo) makes it non-slip. The side is slightly flattened and indented to fit ergonomically in your hand. The large screw-on cap and simple design makes it very easy to clean. The flip-top provides fast, easy access and is just the right size allowing you to drink quickly without spills. The lowest price, least aesthetic, most functional water bottle we have tried. GREEN RATING We give all re-usable water bottles a Deep Green rating not only because they are an invaluable tool in reducing waste (100 tons of PET bottle waste enter Hong Kong landfills each and every day), but also because they reduce carbon emissions resulting from the production, transportation and refrigeration of bottled drinks. AVAILABLE in some WingOn department stores and Vanguard supermarkets. This is a followup to our previous article The Right Water Bottle for You where we reviewed plastic, aluminium and stainless steel bottles. This bottle solves many of the issues we found with those designs. Unlike the stainless steel bottles, it is lightweight, a very important attribute for something you’re carrying around with you all day. All the bottles we previously reviewed are round and smooth making them slippery to hold especially when wet. The stainless steel and aluminium bottles look great when new, but dent easily when dropped. While getting ready to leave the house one day, my old stainless steel bottle slipped out of my hand. Full of water, it left a dent in the wooden floor (hope my landlord is not reading this!). We found with all the previous designs, you had to chose between a large mouth that makes it easy to clean the inside (and add ice cubes) but also more difficult to drink from when moving or those with a small mouth that is hard to clean but allows greater control when drinking. This bottle solves this by incorporating a smaller flip-top into the larger screw cap. The flip-top is leak proof and fast and easy to open and close. While the large mouth screw cap makes it a cinch to clean the inside. Overall, the simplicity of the design, in contrast to many of the newer bottles on the market these days, makes it very easy to clean. The semi-transparent plastic with both ml and oz markings on the side make it easy to tell how much water you have left. It also seems quite resistant to odours and tastes. The drawbacks are two-fold. One, you can only put warm, not hot, water in it. Two, its not very cool looking. It would also have been handy to have a ring in the cap for hanging. All in all, it is just right for a purely utilitarian person like me, who values functionality, quality and value for your money above aesthetics. We have used it for less than six months so cannot comment on its durability. 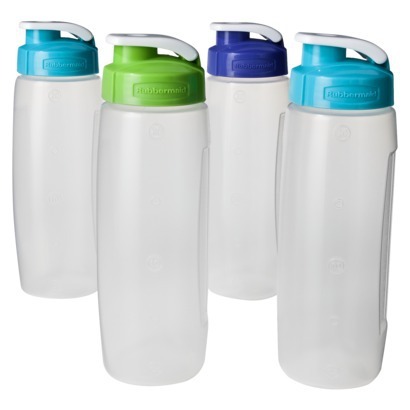 But based on our experience with other Rubbermaid products, we are quite confident in recommending this bottle. Thirsty? Download our Water For Free iPhone mobile app (Android coming soon) to find a water fountain near you!